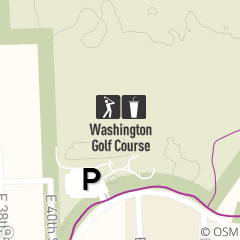 Book a tee time at Washington Golf Course, less than 10 minutes from downtown Cleveland. Washington Golf Course is the highlight of Cleveland Metroparks Washington Reservation in the cities of Newburgh Heights and Cleveland. The beautiful 9-hole, par 29 golf course and 30-station driving range was designed by Brit Stenson of International Marketing Group (IMG) located in Cleveland. Financed by The First Tee of Cleveland, and managed by Cleveland Metroparks, the course opened in the spring of 2006. The First Tee of Cleveland Inc., formed in 1999, is an official chapter of The First Tee, a national initiative that promotes youth character development and life enhancing values through the game of golf. Find out more about for The First Tee of Cleveland youth programs and how to volunteer. Washington Golf Course also represents a unique collaboration with the City of Cleveland and Cleveland Municipal School District, through partnership with Washington Park Horticulture Center. The horticulture center offers curriculum in turf management, animal care, greenhouse production, landscape mechanics, and floral design providing opportunities for high school students to develop career skills. Washington Golf Course is designated as an Audubon International Certified Gold Signature Sanctuary through the Audubon International Signature Program recognizing the high quality of environmental stewardship reflected in the golf course design and maintenance. Signature certification is awarded only to new developments that are designed, constructed and maintained according to Audubon International's precise planning standards and environmental disciplines. The focus of the Signature Program is to promote sound land management practices and appropriate land use changes based on sound scientific research. The certification also ranks Washington Golf Course as the ninth Certified Gold Signature Sanctuary golf course in the United States and 10th in the world and overall, the 14th Certified Gold Signature Sanctuary in the U.S. and 15th in the world. In addition, it is the third Certified Signature Sanctuary overall in Ohio.